Alcester is 8 miles from Stratford-upon-Avon. In Roman times Alcester was an important town, standing as it did on the junction of the Ryknild Street Roman road and the ancient Salt Way to Droitwich. Today, you can follow the Heritage Trail to see a number of well preserved Tudor and Georgian buildings in the town. 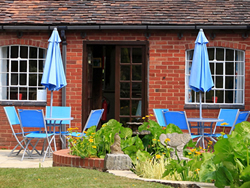 Broom hall inn offers 12 rooms with ensuite bathroom, heating, tv and coffee/tea making facilities. it also offers a bar, restaurant and a meeting room. Modern 4 Star Accommodation Ideally Located With In Walking Distance Of Alcester Town Centre. Also Offers Easy Access To The M40 And M42 Motorways Plus The Nec And Birmingham Airport.